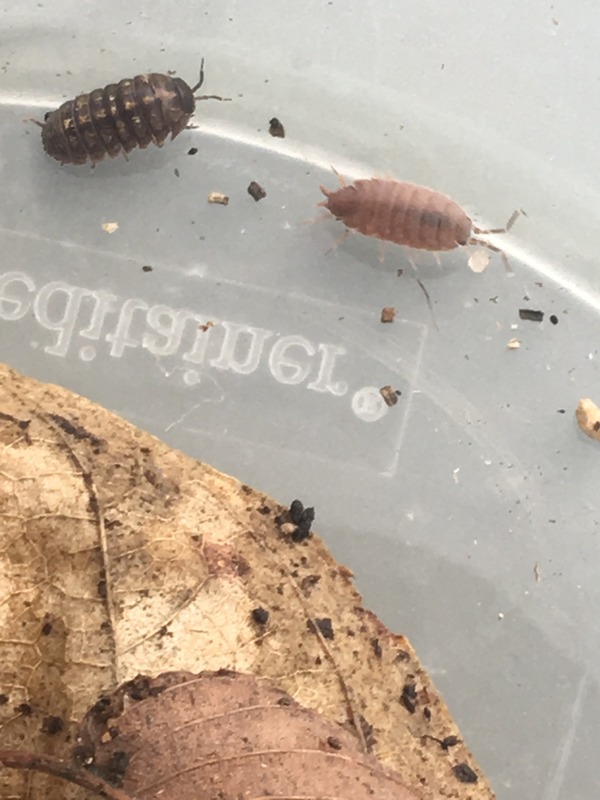 I have a little, basically empty greenhouse in my yard that doesn't really have anything in it aside from some cardboard boxes and empty planters, but it seems to have become a favorite hangout spot for two species of isopod. 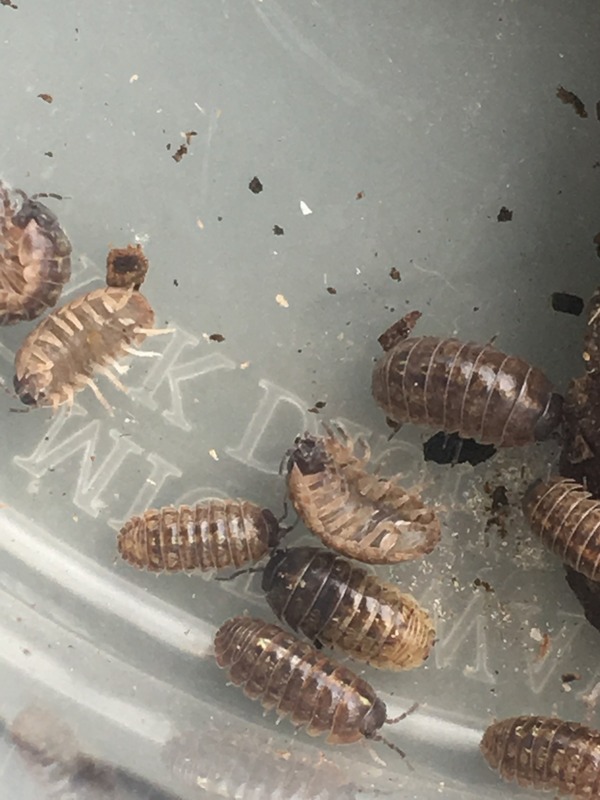 I happened to move a box in there and saw Porcellio isopods, which I haven't seen in a year or so, so I went after them to try and catch some for ID. And, while I was doing that, I found an orange A. vulgare! Also a vulgare with a black front half and sort of a golden-yellow back half, which I REALLY hope is genetic, because that's pretty cool. I'd love to get that as a morph and just call them "pharmacy", since that half-and-half color makes them look more like their namesake. I collected as many A. vulgare as I could see that looked even vaguely orange, though "vaguely" was the best I got for the rest. Those have gotta have the right genetics, I figure. I'm going to go out to a few different areas and look for more orange ones, too, and I'm gonna check out my greenhouse again in a couple days once they've gotten over being bothered. 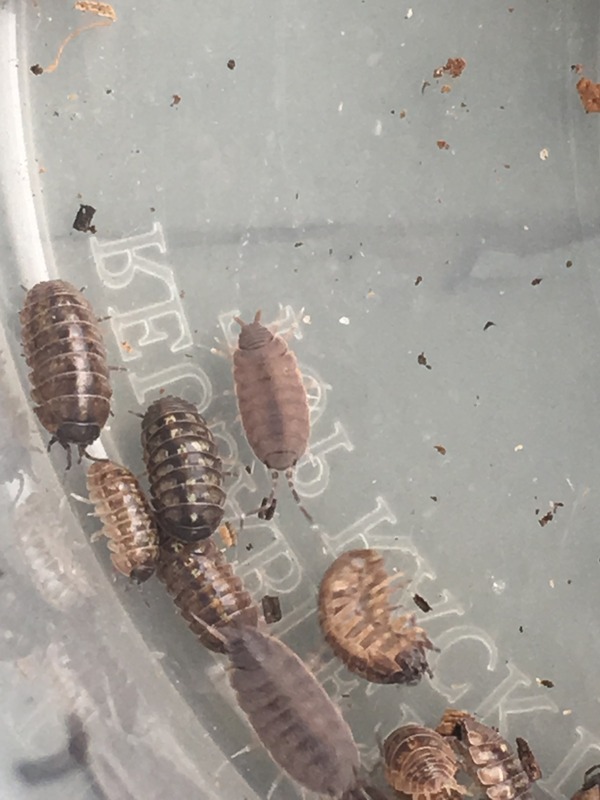 I also took two large (over half an inch, easy) vulgare out of my peppered roach enclosure and put them in with the other vulgare, in hopes that their size is genetic. I got their enclosures set up. Each one has a 2.5gal tank with about an inch and a half of coco fiber in the bottom. I didn't want to go deeper because I don't want it to go stagnant. Gonna try to catch some springtails outside- if you find leaf litter with enough in it, you can pick up individual bits with the springtails on it and put those in a container without worrying about what else might be living in there. They also have some hardwood leaves, and each tank has half a cuttlebone and an entire deer bone. One got a scapula, one got a rib. Tomorrow, once they've had time to calm down, I'm going to give each tank 1 piece of dry cat food. I'm going to wait for them to have babies and for the babies to get big enough to see the colors properly. Once they do, I'll set up a 5g tank and start taking out the ones that are furthest from the goal colors. The rejects of both species go into the 5g to breed as they want, and if I see any brightly colored ones in the 5g, they go into their respective 2.5g. At first, I'll only be taking out the ones with a lot of gray, so I'll still have decent numbers (hopefully) in the breeding tanks. Don't want to thin it down to just 2 or 3 orange ones in the first generation. That's the most orange one. It's a bit brighter in person, a nice burnt orange, definitely eye-catching compared to the rest. That's my half-n-half. Any idea if that's a genetic thing? You can also see that some of the others have a little orange tinge to them. These are my Porcellionides. I saw but didn't manage to catch more of the standard grayish-blue ones, but I got a few of these. They're sort of an orange-pink with areas of grayish-purple. I'm going to try to get a strain going that's a nice mix of dusk-related colors, I think. I know people have already gotten orange ones, so I'll aim for something more like the one in this photo, just a reliably producing strain. For the vulgare, I'm going to shoot for a deeper orange than I see in other orange morph pics. A lot of them seem to be the light orange, and I like deep oranges. Heck, maybe I can even get it more towards red. I'm super excited to see how this goes! And I've found more today! Another nice orange one, though a bit less intense and a bit more speckled than the other one. It was crawling around in a puddle but hadn't drowned yet. Their gills mean they can live underwater for a little while before the comparatively low oxygen in the water gets to them. I also found a handful more of the orange-tinged ones. Any update on the half and half guy? 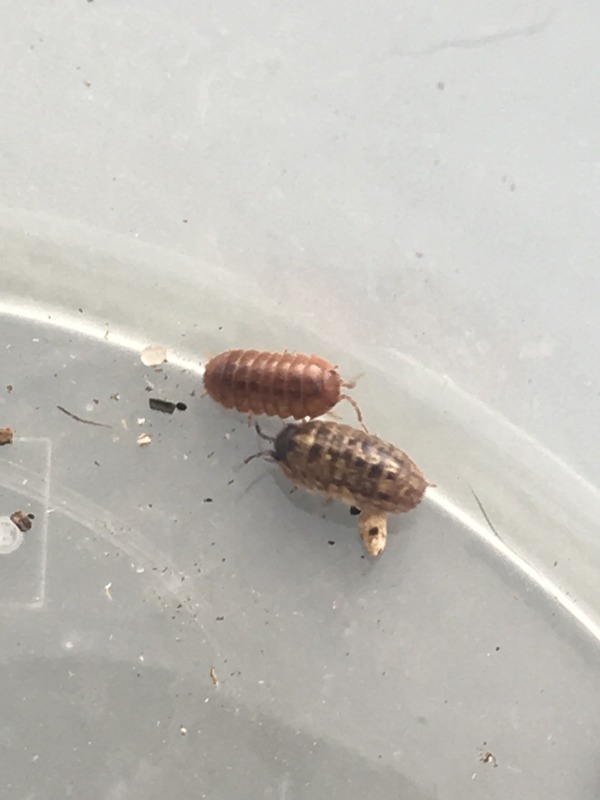 I looked around and I couldn't find any isopods that looked like either half of him. I assume he was hiding. I'll update if I spot him again. Or if I start seeing matching babies.